The aggregation behaviour of biomimetic polypeptide hybrid copolymers and copolypeptides is here reviewed with a particular eye on the occurrence of secondary structure effects. Structure elements like α-helix or β-sheet can induce a deviation from the “classical” phase behaviour and promote the formation of vesicles or hierarchical superstructures with ordering in the length-scale of microns. Polypeptide copolymers are therefore considered as models to study self-assembly processes in biological systems. In addition, they offer a great potential for a production of novel advanced materials and colloids. 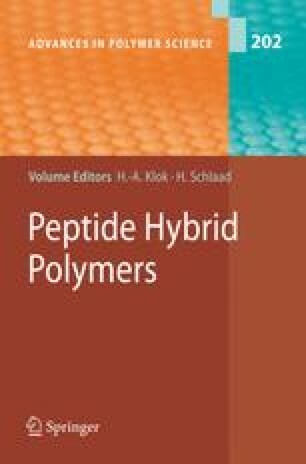 The author would like to thank his former coworkers Hildegard Kukula, Magdalena Losik, and Rémi Soula for working in the field of polypeptide hybrid polymers and also Markus Antonietti and Erich C. Financial support was given by the Max Planck Society.